Teeth Floating Demonstration with Dr. Floron Faries. Over 20 beef cattle livestock producers from both Starr County and Hidalgo County were present at the Beef Cattle Health Herd and Horse Program which took place on May 27, 2010 at Briggs Ranch off of Hwy 83 in Rio Grande City, Texas. 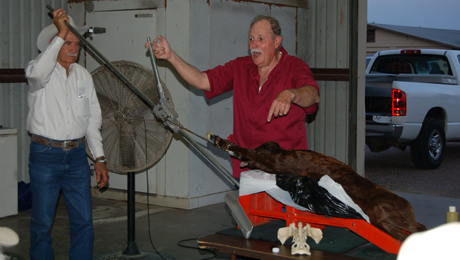 Cooperative Extension Program Agent Ronnie Zamora stated, that “The highlights of the program included topics in; Range & Pasture Insurance by Mr. Adrian Perez, AGRI-INSURANCE, Calf Pulling Demonstration and Floating Teeth in Horses by Dr. Floron Faries, Associate Professor & Extension Program Leader for Veterinarian Medicine”. 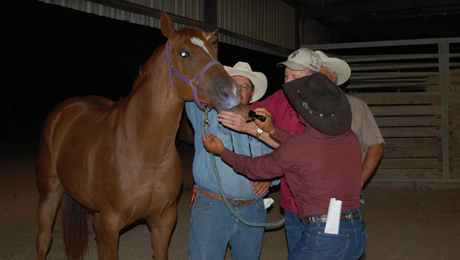 This four hour program involved much discussion on a pulling calf demonstration provided by Dr. F. Feries along with a floating teeth demonstration on horses from Briggs Ranch. This program was made possible by the following: Briggs Ranch, Rio Grande City, Texas, Agriculture & Natural Resource Committee, Cooperative Extension Program, and Texas Agrilife Extension Service. in a pulling calf demonstration.